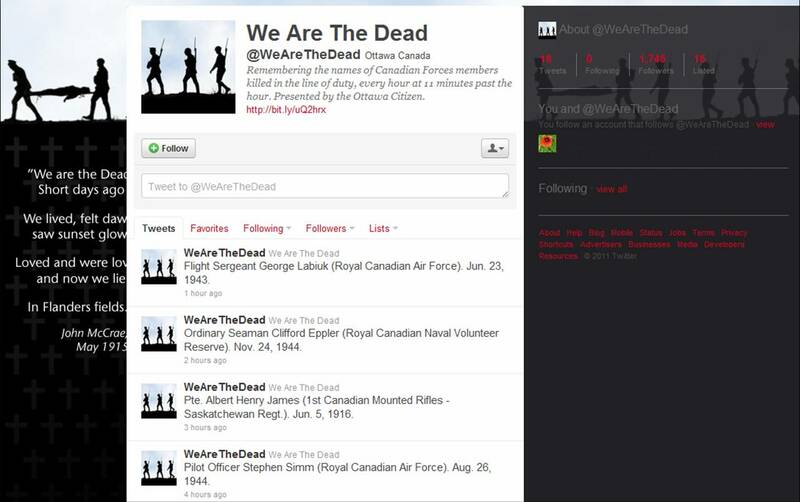 The Ottawa Citizen has started a memorial Twitter account for members of the Canadian Forces who have lost their lives in conflict. The account will tweet the name of one service member at 11 minutes past every hour. The name is chosen at random by a computer from a list of more than 119,000 Canadians killed in two World Wars, the Korean war, the war in Afghanistan and other conflicts. It will take 13 years to tweet all the names on the list, meaning the Twitter account will have to be running until June 2025. The managing editor of the Ottawa Citizen, Andrew Potter, said there is no reason why people should only remember once a year, "when we march and mourn and pray and lament." "Through this Twitter account, and through more extensive use of social media down the line, we hope to make the act of keeping faith a more subtle, but in many ways more permanent feature, of the lives of Canadians."